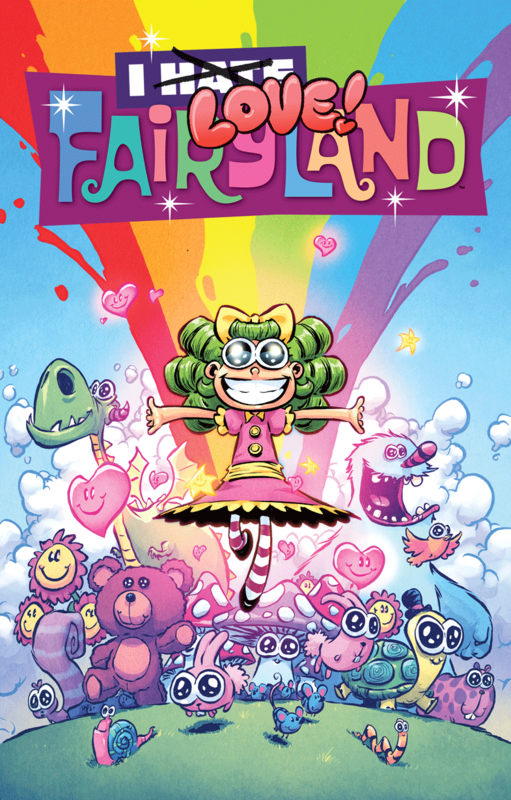 I Hate Fairyland #15 explores two new avenues for Gert, and one path we’ve seen before. Ironically being good proves to be the death of her and her one way ticket to hell. Nonetheless, it makes for a fun story with all the usual carnage and cuteness. In the previous issue, Gert rubbed the balls of redemption and regained her beauty and inner innocence. With her newfound chance on life, she’s found a way to solve all the riddles of Fairyland and find her way back home. Alas, right before opening the door, she gets attacked by a band of assassins. This time she does not escape death. But it’s not the end for Gert. She can still look forward to hell. Heh, well, the readers can look forward to it at least. Who knows what we’re in for in the next issue, but it promises to be entertaining. I Hate Fairyland #15 packs in some wonderful twists and continues to overflow with luscious artwork on every page. Thus I give it a five out of five metal bikinis.